While the US may have a plethora of subscriptions for book nerds of all kinds, other places are jumping on the bandwagon. 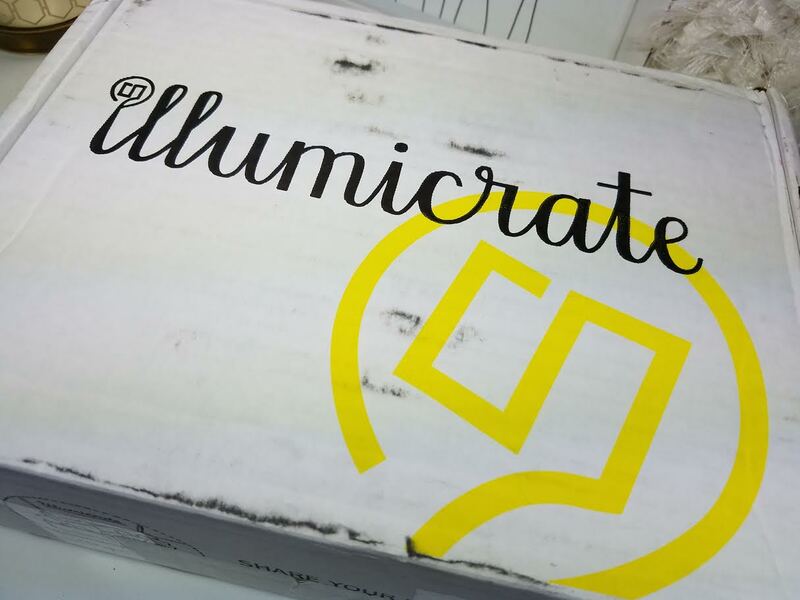 One of the best book boxes I've found in the UK is Illumicrate. 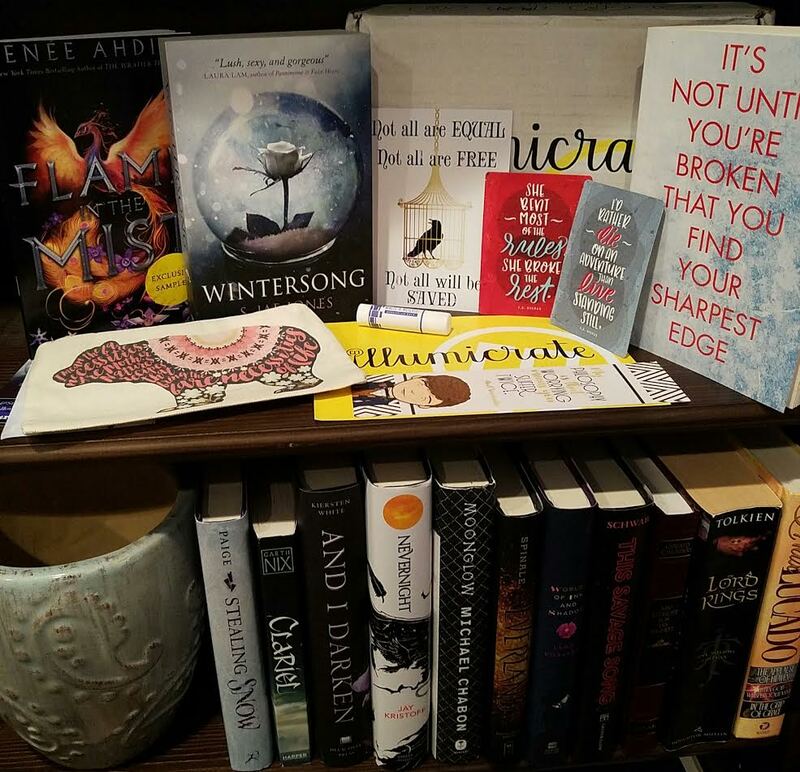 This box is curated by Daphne at Winged Reviews. This is a guilty pleasure for me because it's rather expensive with shipping to the US. Subscribers in the UK get free shipping so it's less of a big deal. One of the best things about this box, besides the contents is that it's quarterly. I really like that option because while I read plenty of books in a month, a monthly subscription gets pricey. I find it's super do-able when it's quarterly. If I was living in the UK I would never unsubscribe! If you are outside the UK, know you'll get the UK version of the books included. I think that's pretty sweet. The Cost: £29.99/quarter. If you're outside the UK add £9.99 shipping. I think my total was $50USD. 'Wintersong' by S. Jae-Jones- Yes!! This is on my TBR on GoodReads and I've got it on hold from the library. Lucky me, I get to cancel my hold since I have this in my hands now. Yay!! Plus it came with a letter and bookplate from the author and a bookmark. This seems like a retelling of the Goblin King fairy tale. I'm intrigued because the last one I read was the Malediction Trilogy by Danielle Jensen (It starts with Stolen Songbird) and I LOVED IT! So I'm excited about this one. Deep in his terrifying realm underground, the cold and forbidding Goblin King casts a dark shadow over nineteen-year-old Liesl. Her grandmother had always warned her to follow the old laws, for every year on the longest night of winter the Goblin King will emerge into the waking world in search of his eternal bride. Sensible and plain, Liesl knows it's her duty to keep her beautiful sister safe from harm, but she wishes only to indulge in her wild, captivating music, composed and played in secret in the Goblin King's honor. When her beautiful sister Käthe is stolen by the Goblin King, Liesl knows she must set aside her childish fantasies to journey to the Underground and save her. Drawn despite herself to the strange, beautiful world she finds--and the mysterious man who rules it--she finds herself facing an impossible choice. With time and the old laws working against her, Liesl must discover who she truly is before her fate is sealed. 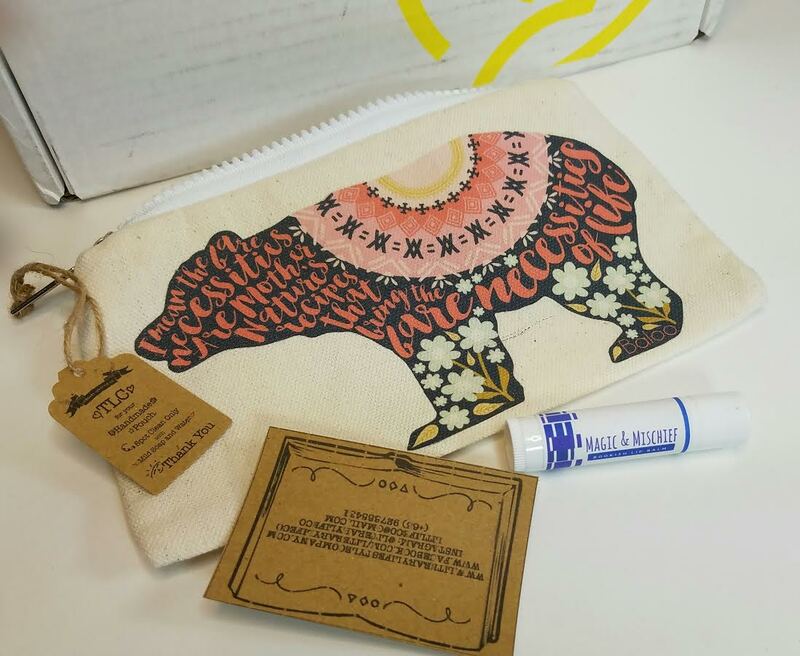 Literary Lifestyle Co. Bare Necessities Pouch- A little make up, some pencils or stickers... whatever you put in it, it's definitely cute. Bookish Serendipity Co. Magic and Mischief Lip Balm- All natural lip balm. I know I always need more since I lose them constantly. Unfortunately, this is a poorly made lip balm. It's gritty and nearly impossible to spread on my lips. Not good. 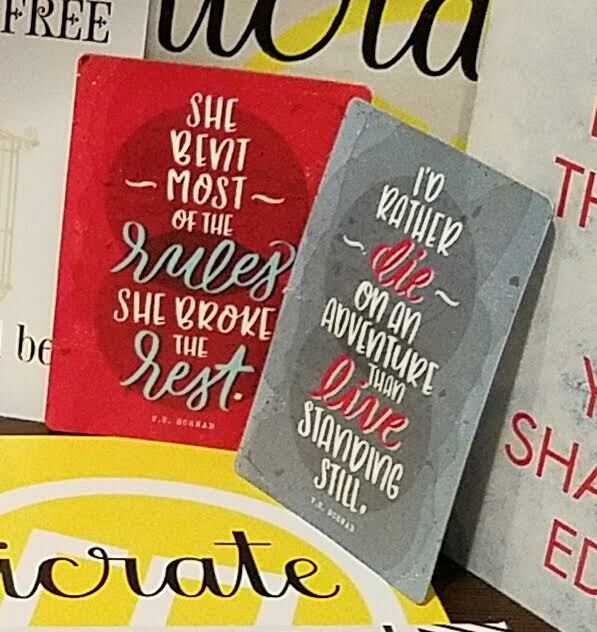 Her Bookish Things Darker Shade Magnets- I loved 'A Darker Shade of Magic' and these quotes are pretty awesome. They're already on my fridge. 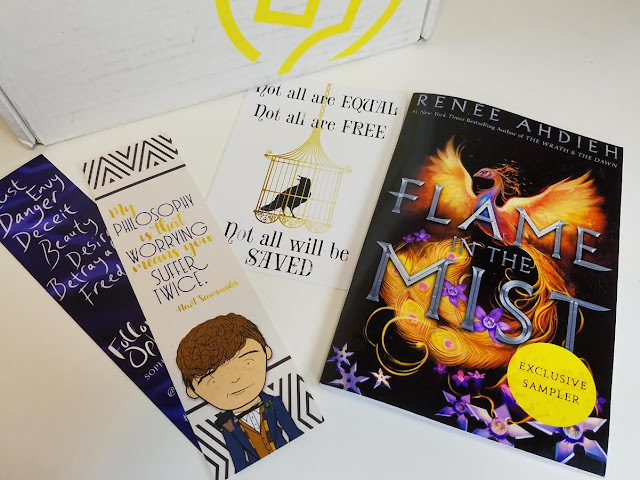 Jane's Tiny Things Newt Scamander Bookmark- I'm so glad this showed up because it reminded me that I forgot to go see Fantastic Beasts in the theatre but I still want to see it. Plus some bookish extras from Following Ophelia, Gilded Cage and an excerpt from Flame in the Mist by Renee Ahdieh. 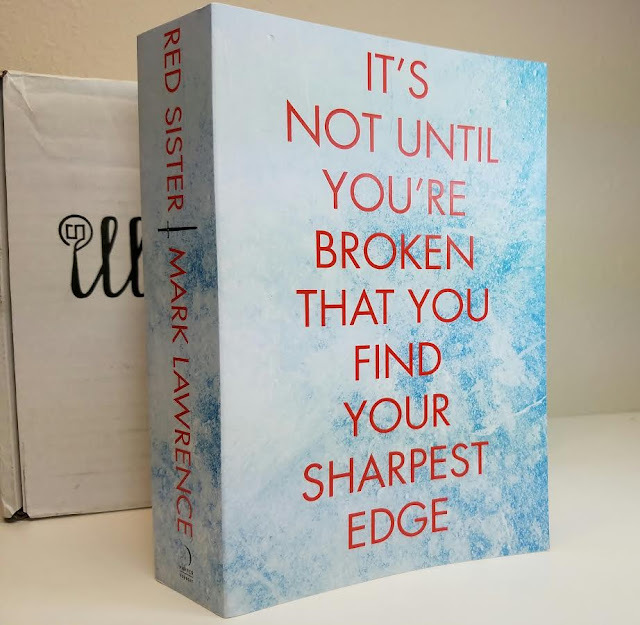 'Red Sister' by Mark Lawrence- This is an ARC and I'm so glad to have it!! I like Mark Lawrence and while somewhere in the back of my brain seeing this jingled a bell, I hadn't really been thinking about a new release by him. His books are not for the faint of heart, I will say that. He writes dark, gritty war stories. Adult revenge fantasy, I suppose. Sort of along the lines of Game of Thrones. Full of anti-heroes and death. If you want a beautifully written story that's more YA but along these same lines, you need to read Grave Mercy by Robin LaFevers. It's the first in a trilogy (all written and ready for you to devour!) and is a very interesting take on convent-trained assassins. OMG... I just discovered there are two more in the series! Yes! So I guess it's not a trilogy but there is resolution at the end of each book so that counts, right? VERDICT: I love the curation of Illumicrate and I really enjoy the extra books that tend to be included (my last Illumicrate had two books, too). I definitely think Daphne picks good books and while I enjoy everything, the cost is a bit much for me living in the US. Now if my husband got a job in London, I'd be re-subscribing in a second! I do really like the fact that this is quarterly, it's super easy to skip a shipment from your account and there are no hoops to jump through when you cancel. Click and done. It's definitely a benefit. If you would like to sign up for Illumicrate, you can do that here. I found a coupon for 10% off, too. It's KATH10 so don't forget to use it! What do you think of the book choices? 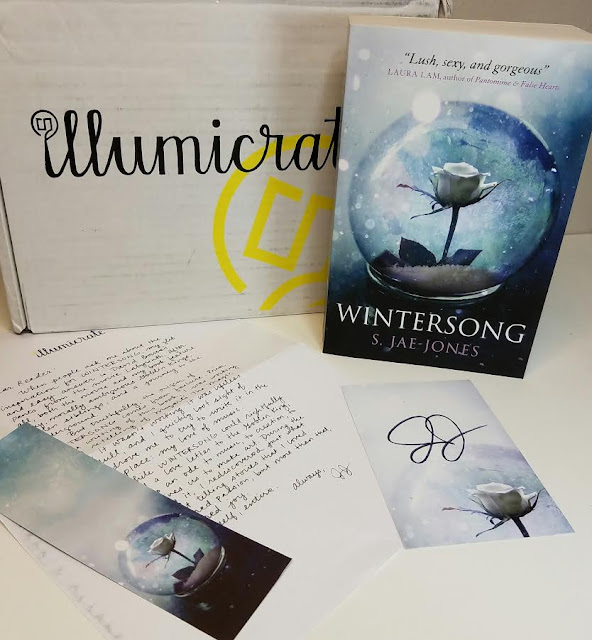 Have you read Wintersong yet? Yuuuup!! I added them to my list already. They don't come out for awhile but you bet I'm reading them when they do! I had to tell my mom, too, since she's the one who originally recommended them to me.